Well we managed three flights. All safely back in the hangar now. Mind you, the sun has just come out again.... I wonder? Strong winds and forecast rain have not stopped us getting the kit out. A useful training day, especially for Tom Knight of UWE who went solo, seen here being congratulated by his instructor. 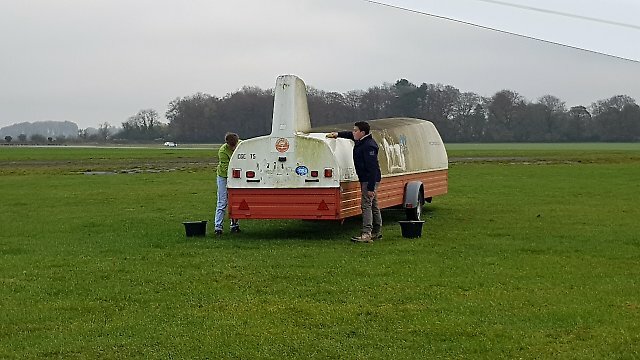 Following its trip to Sutton bank for the Juniors winter series round one a group of UWE students and explorer scouts decided to give the big trailer a jet wash. It wasn't just dirt from the A1 that they had to scrub off! Well done guys. If anyone else wants to wash their trailer or a club one we have a club jet wash which is available for you to use. If you don't know how to wash a trailer there is a training course available. After their display on Saturday evening, the two motor gliders departed around 0800 for Hus Bos after a runway beat up. With a brisk 16-18 knot easterly forecast, the operation was set up on 09. The first couple of flights were into poor visibility so with the conditions, a limited operation and a good number of UWE students to fly we decided to cancel the trial lessons for the day. It did improve later and some had extended flights but it was cold! We were glad of the hot soup and rolls available in the clubhouse after packing the kit away. I was pleased I’d flossed my teeth this morning – on the One Day Course were Dentist Martin and Dental Technician Andrew. They were good sports and didn’t mind a bit being turned upside down on their last flights. Club members Philippa Roberts and Andrew Mugleston were getting married today down the road in Tetbury (I heard Philippa had a puncture going down the aisle, but I'm sure that’s not true). We wish them a long and happy life together – it ain't going to be dull. Luckily the weather gods got the memo and the clouds cleared around 11.00 to give a sunny if somewhat chilly day. We had a good day’s flying off the west end of the cross runway – there was even a bit of lift about. Many thanks to the UWE students and others for washing the DG500 trailer and to Dave Howell , Pete Laws and Stuart Thackray for driving the winch. An excellent day's flying yesterday with a stiff breeze in the morning moderating to allow a few pilots a little soaring. The longest flight of the day was John Docherty's 14 minutes in LRT. We hope to be flying again on Friday, do come along and join the fun. A small band of enthusiasts and helpers turned up including Tim Brailsford, all the way from Staffordshire. We had a good day with sunshine, mostly blue skies, some thermals, no rain and winds 220 / 20-25kts giving cracking launches for the 2 x Ka 21 and Ka 23 on the line. The head-on sun in the afternoon made landing alongside R/W 21 slightly tricky. Several trial lesson visitors enjoyed their flights and a Bristol University 3rd year aeronautical engineering lady student (“Georgie”), who is Silver C level and currently flying at Nympsfield, dropped in to see our operation. She left duly impressed, and we hope to see more of her. Tim Brailsford last week gained his helicopter pilot’s licence, which will make his round trip from home in Staffs easier if more expensive (!). But the main good news today was seeing Adam Mayo back in action flying with instructors Darren and Simon, following his serious biking accident in Switzerland in the summer and subsequent hospitalisation for head injuries. He has made such good progress we are all relieved he’s fully on the mend and will be able to take up his role as a valued member of the active student / youth contingent at the Club. Monday evening the wind increased so much that a trip to airfield was required to re position the Gliders left out overnight. Tuesday 23rd was as forecast, 25kt winds and gusts of 40kts or more. All except Christoph decided that the rewards did not justify the risk and we would not fly. Christoph self launched in his DG400, reaching 1000ft in the length of the airfield, looking more like a helicopter than a Glider. He managed a max climb in weak wave to 3000ft, spending as much time going backwards over the ground as he did forward. He made a safe landing a couple of hours later and we all retired for food. Wednesday had promise, some the locals were up and away early aero towing or self launching into the hills. The rest including us waiting for the cloud to lift off the hill enough to enable us to launch, by 10 am the cloud started to clear and there was a steady stream of winch and Aero tow launches looking for wave. The conditions were unusual with the outside air temp at 3000ft 8 deg c, and at 6000ft 15 deg c with the wave locally petering out at 7000ft. 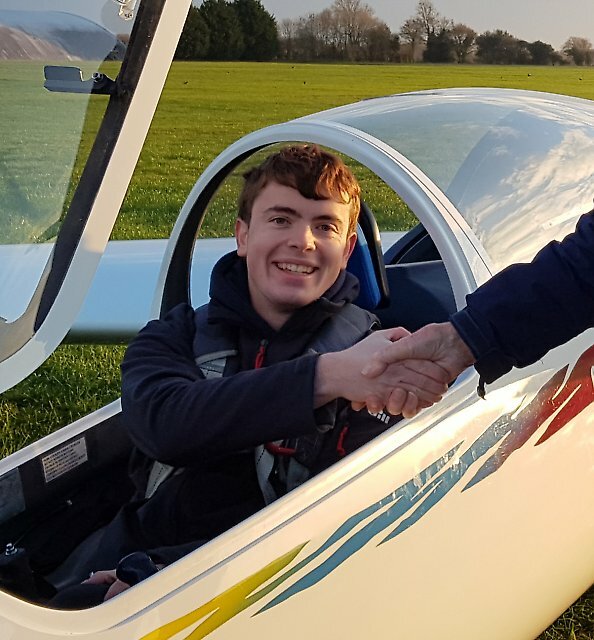 All pilots contacted the wave achieving heights of over 6000ft, with notable achievements from Caleb McKinstry who reached 7000ft and Martin Hayward who flew the DG500 GBZ solo reaching over 6000ft on their first solo wave flights. 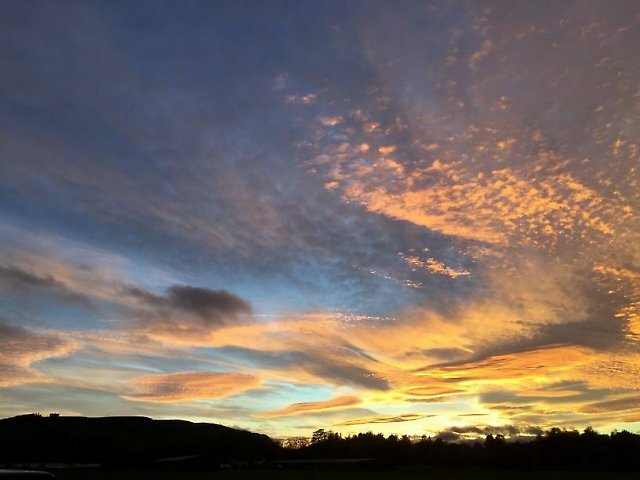 Picture shows The evening sky as we left the airfield. All 11 pilots and aircraft arrived safely and by Saturday evening and most got their paperwork signed ready for the week. Sunday was forecast for rain in the morning, the forecast was correct and the airspace and weather briefing was well attended in the morning. The weather cleared lunch time and all the visiting gliders were rigged and enjoyed an afternoon on the ridge and very fickle weak wave. Monday was forecast to wave with the winds strengthening in the afternoon, all except one launched in the morning and the wave worked, unfortunately the gaps kept filling in so 8000ft was the most we could get.